Figure from: “Chou, C.-L.; Rivera, A.L. ; Caplan, A.I. ; Goldberg, V.M. ; Welter, J.F. ; and Baskaran, H.: Micrometer scale guidance of mesenchymal stem cells to form structurally oriented cartilage extracellular matrix. 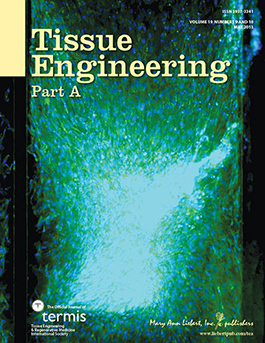 Tissue Engineering, Part A 2013, 19(9-10):1081 – 1090.” Abstract Selected as cover art for “Tissue Engineering Part A – 2013”. Dean, D.; George, J.E. ; Varghai, D.; Cooke, M.N. ; Min, K.-J. ; Dennis, J.; Fisher, J.P., Rimnac, C.M. ; Lennon, D.P. ; Sun, J.; Mikos, A.G.; and Caplan, A.: Additive Manufacturing of Poly(Propylene Fumarate) Tissue Engineered Constructs for a Canine Critical Size Cranial Defect. Acta Biomaterialia, Submitted 2012. Sorrell, J.M. and Caplan, A.I. : Mesenchymal stem cells in skin and in the role of mesenchymal stem cells in cutaneous wound repair. J Invest Dermatol, (Submitted). Bonfield, T.L. ; Lennon, D.; and Caplan, A.I. : Human mesenchymal stem cells resolve infection and inflammation in pseudomonas aeruginosa infected cystic fibrosis transmembrane receptor knockout mice. Am J Physiol Lung Cell Mol Physiol, Submitted 2012. Caplan, A.: MSCs as Therapeutics. In: Stem Cell Biology and Regenerative Medicine. Mesenchymal Stromal Cells: Biology and Clinical Applications, Stem Cell Biology and Regenerative Medicine. Hematti, P. and Keating, A. (Eds. ), Springer Science+Business Media New York, Chapter 5. Accepted 2012. Caplan, A.I. : MSCs: The New Medicine (invited chapter) In: Stem Cells in Regenerative Medicine: Science, Regulation, and Business Strategies. A Vertes (Eds), John Wiley & Sons, Ltd, Accepted 2012. Caplan, A.I. : Mesenchymal Stem Cells in Regenerative Medicine. In: Handbook of Stem Cells, Vol 2, eds A Atala and R Lanza, eds. Academic Press, Chapter 43, Pp. 493-502 , 2012.
da Silva Meirelles, L.; Caplan, A.I. ; and Nardi, N.B. : Pericytes as the source of mesenchymal stem cells. In: Resident Stem Cells and Regenerative Therapy, Goldenberg, R.C. and de Carvalho, A.C.C., eds. Elsevier Inc. Chapter 12, Pp. 233-250, 2012. Caplan, A.I. : What’s in a name? Tissue Eng Part A. 2010, 16(8):2415-7. Bonfield, T.L. ; Koloze, M.; Lennon, D.; Zuchowski, B.; Yang, S.E. ; and Caplan, A.I. : Acute asthma: An in vivo model for human mesenchymal stem cell efficacy. J. Immunol Methods. Submitted 2009. Sorrell, J.M. ; Baber, M.A. ; and Caplan, A.I. : Influence of Adult Mesenchymal Stem Cells on In Vitro Vascular Formation. In: Advances in Tissue Engineering, Volume 1: Angiogenesis. Chapter 24, Pp. 241-248, 2010. Caplan, A.I. : Mesenchymal stem cells: The past, the present, the future. Cartilage 1(1)6-9, 2010.
da Silva Meirelles, L.; Sand,T.T. ; Harman, R.J.; Lennon, D.P. ; Caplan, A.I. : MSC frequency correlates with blood vessel density in equine adipose tissue. Tissue Engineering, Part A 15(2): 221-229, 2009. Sorrell, J.M. and Caplan, A.I. : Fibroblasts – A diverse population at the center of it all. International Review of Cell and Molecular Biology, (Submitted), 2009. Butler, D.L; Lewis, J.F. ; Frank, C.B; Banes, A.J. ; Caplan, A.I. ; de Deyne, P.G. et al. : Evaluation criteria for musculoskeletal and craniofacial tissue engineering constructs: A conference report. Tissue Engineering, Part A 14(12): 2089-2104, 2008.
da Silva Meirelles, L.; Caplan, A.I. ; and Nardi, N.B. : The mesenchymal stem cell niche. 2007 (Submitted). Correa D and Goldberg VM (2011): Stem Cells in Orthopaedics. American Academy of Orthopaedic Surgery (AAOS) 5(7):41-45. Invited Review article. Correa D.; Lin, P.; Somoza, R.; Schiemann, W.P. ; and Caplan, A.I. : Bone marrow Mesenchymal Stem Cells (BM-MSCs) regulate melanoma cancer cell extravasation at their perivascular niche. Journal of Experimental medicine, (2014) (submitted). Somoza, R.A; Acevedo, C.A. ; Weinstein-Oppenheimer, C.; Luz, P.A. ; Carrión, F.; and Young, M.E. : TGF-ß3 secretion by human dental follicle mesenchymal stem cells (hDF-MSC) encapsulated in alginate and fibrin scaffolds. Journal of Tissue Engineering and Regenerative Medicine 2014 (in revision). Enrione, J.; Osorio, F.; López, D.; Weinstein-Oppenheimer, C.; Fuentes, M.A. ; Cereani, R.; Brown, D.I. ; Albornoz, F.; Sánchez, E.; Villalobos, P.; Somoza, R.A.; Young, M.E. ; and Acevedo, C.A. : Characterization of a gelatin/chitosan/hyaluronan scaffold-polymer. Electronic Journal of Biotechnology, 2010 DOI: 10.2225/vol13-issue5-fulltext-15. Jean F. Welter, M.D., M.Sc., Ph.D.
Holt, V.; Welter, J.F. ; Berilla, J.A. ; Harris, M.; and Caplan, A.I. : Cell capture apparatus and staining device. Provisional patent application number 61/875918 filed September 10, 2013. Welter, J.F. ; Solchaga, L.A.; Berilla, J.A. ; and Penick, K.: Apparatus and method for tissue engineering. US Patent # 8,507,266 issued August 13, 2013.